In 2005, Israel’s planners knew that the country would have to achieve a breakthrough on the technological front. 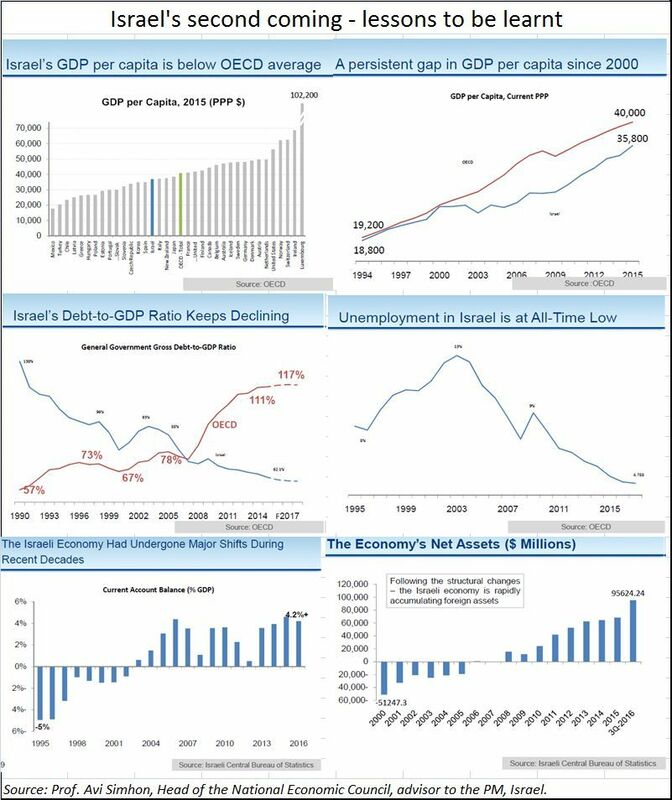 The GDP (Gross Domestic Product) had been growing. But per capita incomes had not been growing fast enough (see chart). Then the turnaround began. It seemed as if Israel was on the march once again. Other numbers corroborated this. Government expenditure as a percentage of GDP began falling. From around 80 percent of total expenditure during the 1990s, it had fallen to around 55 percent in 2002. Currently it stands at almost 40 percent. More investment was now being met out of private funds. The unemployment number also came down to around 4 percent. Exports by the hi-tech sector began climbing sharply from just $40 billion in 2005 to $80 billion by 2015. The current account deficit number had also begun to look a lot healthier. 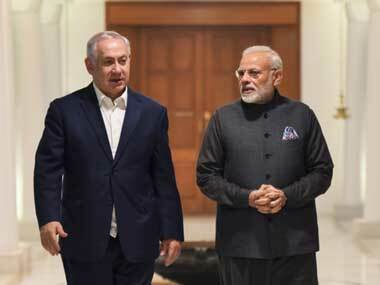 And now Israel wants to grow further, and consolidate its position even further by strengthening ties with India. Not that Israel alone is doing the wooing. India’s ardour is equally strong. Israel knows that if it must grow faster, it must find large markets. And for the next few decades the largest markets will be in India and China. But something happened in 2004 which led Israel closer to India. Nobody talks about this officially. But people in the know discuss how Israel was about to export a surveillance aircraft to China. The deal had been struck some years earlier. Advance money had been put up. And the consignment was ready to be shipped and had to be ported onto a large aircraft for being assembled and fitted in China. It was possibly one of the best surveillance aircraft ever built, and could be used for both offensive and defensive applications. That was when the US is said to have stepped in. 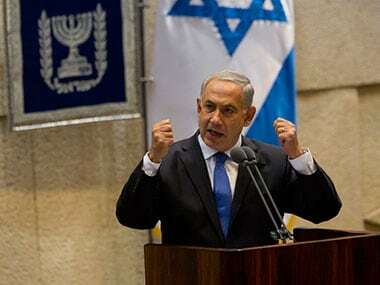 It cast its veto urging Israel to cancel this deal. The US and Israel collaborate on several cutting edge technologies which can have dual use applications – defence and civilian. And the US has a veto on the export of such technologies. 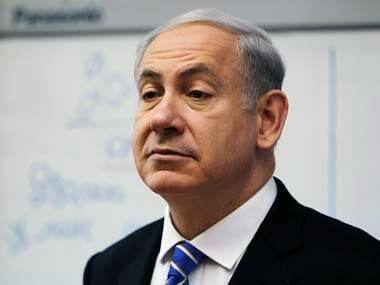 Israel had no choice but to cancel the deal and even pay a penalty of over $100 million to China. 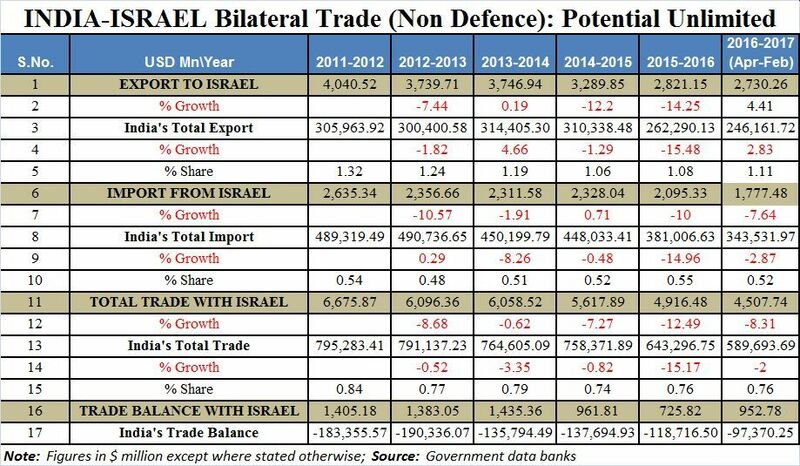 After that year, hardly any defence equipment gets sold by Israel to China. That is possibly where India automatically became more important to Israel. India is, after all, one of the biggest defence equipment purchasers in the world. 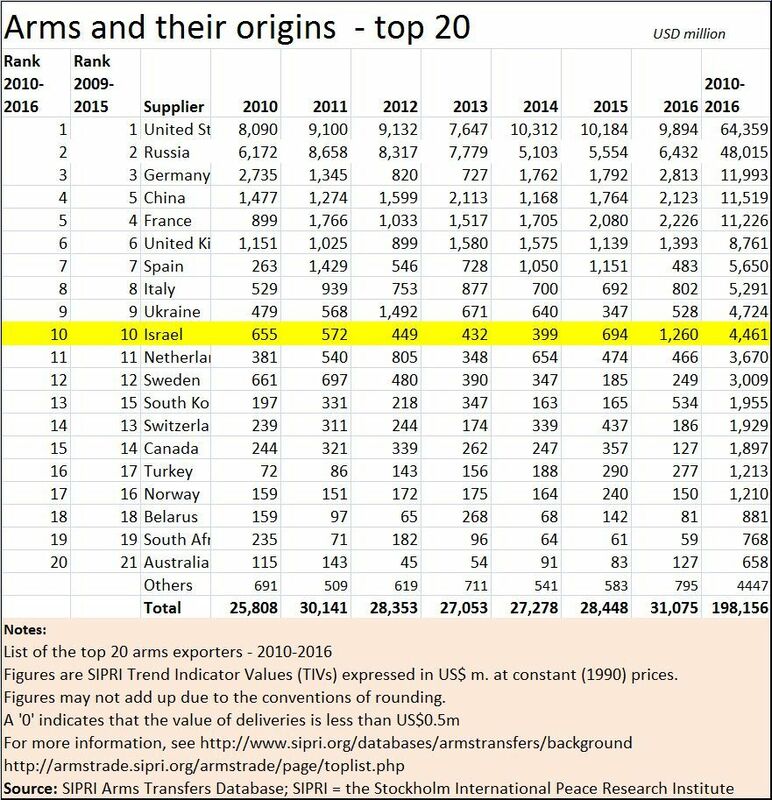 Israel too is a major exporter of arms (see table) . Moreover, unlike defence imports from many countries, two countries which have actually assisted India in technology transfers and integration are Russia and Israel. Hence, both countries found tremendous comfort with each other. In addition to defence needs, India needs technologies and advice for water management, water recycling, desalination plants. These are areas where Israel’s expertise is second to none. Linked to that is technologies related to agriculture and animal husbandry. The drip irrigation system (also known as micro-irrigation and fertigation) originated in Israel, and the country remains one of the pioneers in technologies relating to agriculture, horticulture and maximizing yields with the use of little fertiliser, nutrient and water. Given India’s large population, and hence the need for food security, India needed such a partner. 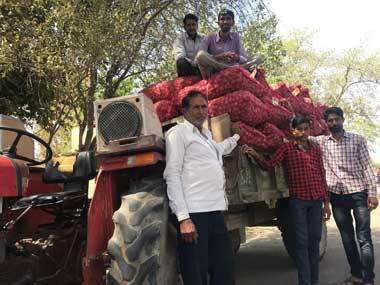 With consumption habits moving away from plain cereals to vegetables, fruit and other protein-rich grain, India will have to work out strategies which insure the farmer against the vagaries of climate change and weather on the one hand, and the need to augment farm incomes on the other. Israel’s assistance in these areas will be of tremendous significance. 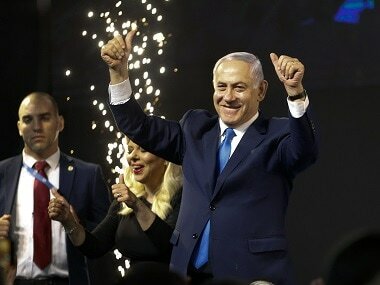 Finally, both countries see the need for using Israel’s expertise in cyber security – especially when it comes to defence-related security on the one hand, and civilian applications on the other. Among the civilian needs already identified are combating financial technology risks and law and order related intelligence gathering and sifting. Both countries have already begun work in these areas. Israel has already set up centres of excellence in agriculture and innovation in India jointly funded by Israeli and Indian industries. Of course, this hasn’t come in easily to Israel. It has consciously moved to remain at the forefront of technology. Today, almost 4.2 percent of GDP is spent on R&D in the civilian space – one of the highest in the world. As against OECD’s average of 8 researchers for every 1,000 people, Israel boasts of 14. But Israeli industry wanted more engineers. True Israel did produce many maths and science graduates from its splendid universities. But the industry wanted engineers, not just theory churners. So Israel’s planners went to the universities. They explained their problem to the academicians. But instead of just allocating money, they provided funds for a 40 percent increase in engineers, without reducing funds for other streams. Quality control at the intake level and focus on output standards were reinforced. Then it began liberalising its immigration rules. It began permitting import of skilled workers provided they could earn at least $5,000 a month. And in order to improve the right ‘chemistry’ at its universities, it began looking for the brightest and best of students from all over the world. Since teaching in Hebrew could be a challenge, it even began teaching courses – as in Technion – in English. That increased the ratio of foreign student in Israeli educational institutions. Today, Indians are the largest non-Israeli students at its campuses, and the number of Indians flocking there for higher studies can be expected to increase. All this is bound to translate into higher bilateral trade. Both countries expect trade to swell from around $4 billion a year today to around $20 billion in a decade. The ambitions are set high. The chemistry is right. The timing could not have been better – with oil losing its clout in global markets. Both countries have political and commercial need for each other. Hopefully, with the top leadership exuding both warmth and confidence, this target should get met in the coming years.